Descubra os contos mais arrepiantes de Londres neste divertido e assustador passeio de pubs assombrados. Ouça histórias de assassinos notórios, assombrações e deboche de seu guia local e visite locais assustadores como a barbearia de Sweeney Todd e o interior macabro de uma prisão vitoriana. Não tenha medo! Você terá uma chance ao longo do caminho para acalmar seus nervos com alguma coragem líquida. No final da turnê de duas horas, você verá Londres em uma luz profundamente assustadora. This tour should have been called Random Facts of London History, Out of Order, Oh- and a Few Pubs on the Way. The tour guide was knowledgable, but he repeated himself a lot and the stories seemed to drag on, with no real point or climactic ending. My favorite quote from the tour was There have been no known ghost sightings in this bar, maybe just a shadow or something, but it has meat pies, and in 19th century London it was an urban legend that people put cats in meat pies. I'm glad I got to see some central London pubs, but the Haunted London part was quite a stretch. There was no Victorian prison. Our guide didn't carry a lantern or anything useful to help identify himself either, just a khaki hat. 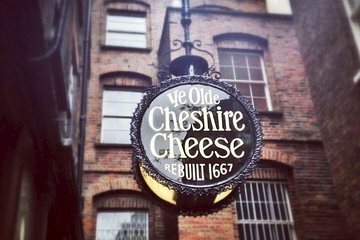 If you're looking for someone to show you a few historic pubs in central London, then this could work - that is if you can handle the poor pointless story telling in between. Very interesting, low key and fun!